Completely free and uniquely customized to your own interests, Chicago Greeter is a year-round service that offers visitors the opportunity to explore Chicago with an insider leading the way. 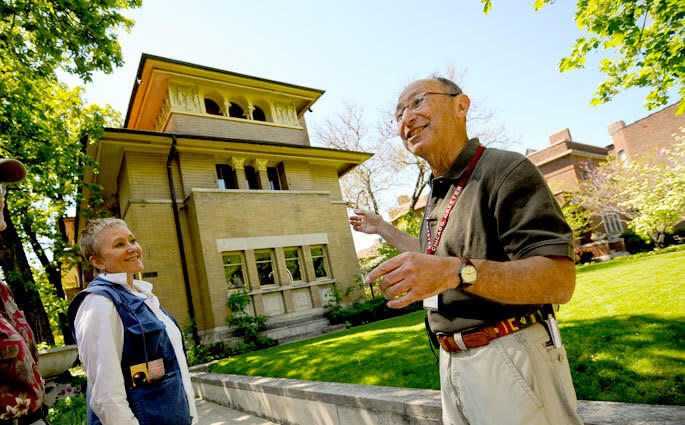 Local volunteers impart their love of Chicago to visitors on free guided walking tours highlighting Chicago’s many neighborhoods, history and cultural attractions. Pre-register at ChicagoGreeter.com for a solo trip or a group of up to six people 10 business days in advance and select a neighborhood or interest area of your choice. You'll be paired with a Greeter who will welcome you downtown then take you on a 2-4 hour visit across the city. Set off by foot together and travel to the surrounding areas by bus or train. This incredibly popular service is offered in 10 languages and covers over 25 neighborhoods and 40 interest areas.